Thermo Fisher Scientific Inc. is the world leader in serving science, with revenues of $17 billion and 50,000 employees in 50 countries. Our mission is to enable our customers to make the world healthier, cleaner and safer. We help our customers accelerate life sciences research, solve complex analytical challenges, improve patient diagnostics and increase laboratory productivity. Our product line of portable analytical instruments, sold under the Thermo Scientific brand, are used to easily and rapidly identify elements in metals and mining applications as well as for chemical identification in safety and security and pharmaceutical applications. 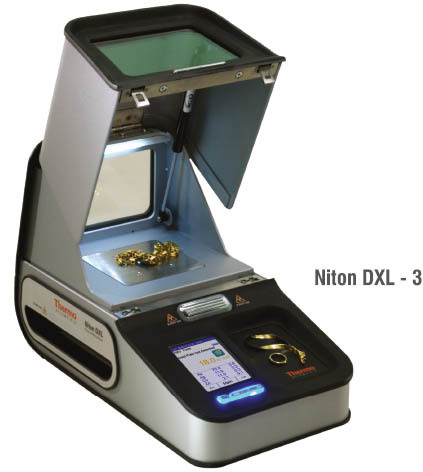 The Thermo Scientific™ Niton™ DXL Precious Metal Analyzer offers a fast, simple nondestructive solution for gold analysis so you can quickly distinguish between gold plating and solid gold and determine the accurate karat (K) weight of gold jewelry. Designed specifically for counter top use in retail environments, the Niton DXL analyzer, with Thermo Scientific™ AuDIT™ gold-plating detection technology, delivers fast, reliable results for gold testing and metal analysis with just the push of a button.